And now it’s over again, the annual DevOps Family gathering a.k.a. 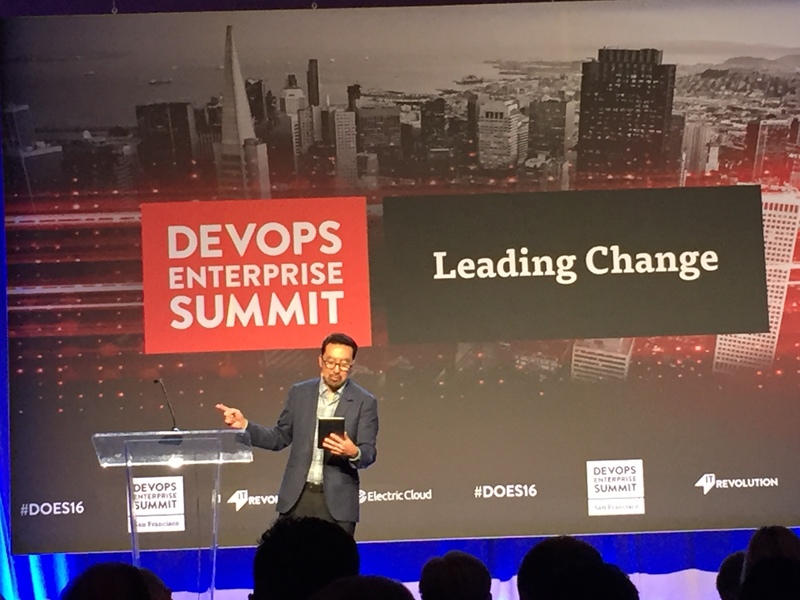 DevOps Enterprise Summit. Another year goes by and we were able to check-in with some of our favorite DevOps leaders and got to know some new family members. The event was full of energy and as every year I am trying to summarize what I have seen. Platforms as enabler and answer to the team structure question – At the first DOES the discussion about “DevOps teams” was still heated; should you or should you not have a dedicated team. Having an internal platform team to run and operate the DevOps platform seems to be the most common solution. The idea that the platform provides self-service capabilities to the product teams and uses this to abstract away the org structure problem was mentioned several times. Another favourite of previous years provided an update on their journey and how a more Ops focused view looks like. The numbers he mentioned are still impressive, with 10x quality and half the time to market achieved through the adoption of DevOps. Their deployment quality is close to perfect with near 0 incidents post deployment (same metric that Heather mentioned). And he also highlighted the self-service platform as key enabler. Another aspect I liked was his focus on automated reporting and making work visible. His colleague Erica than brought the phoenix project to life by comparing her world to the book. I love this. I am writing this summary while waiting for my 17hour delayed AA flight, so I assume there is still some room for improvement on the DevOps front 😉 Their talk focused on the “opportunities” provided by the merger of two airlines and what to do with 2 very different stacks initially and how to slowly merge them. They also highlighted the common challenge with test automation and how to measure success with DevOps. It feels better but how do we really measure it? I mean what can you say about this one…it was fascinating and a geek-out for all of us. So many threads to follow, it felt like Alice in Wonderland for DevOps guys. When you watch this in replay you will feel to urge to buy books and keep googling things. Hold your fire and buy the Beyond the Phoenix project audiobook when it comes out. I surely will! The main themes of Open IP, Platform teams and attracting talent were hit on by Keith. Pivotal’s talk added the product orientation as organisational mechanism to the discussion on platform teams. My good friend Sam Guckenheimer from Microsoft had the guts to do a live demo on stage, which worked out really well and show some very interesting insights into Microsofts developer platform. Carmen DeArdo from Nationwide had one of the best slides in the conference in my view. I really like the cycle transformation picture, what do you think? We had a really good introduction to Site Reliability Engineering by David Blank-Edelmann and the concepts of Error budgets, Blameless post mortems and much more. He also phrased that “You cant fire your way to reliability” and that maturity models should be there to determine the right help, not to punish someone. See you all at DOES 17 Nov 13-15 2017 back in San Francisco. I will be there and will look forward to meet you all there. Come join us at the family gathering next year! This entry was posted in Uncategorized on November 11, 2016 by Mirco Hering.